Each year, this group of educators serves the Cercadillo community by mentoring teachers at a local school. Through daily workshops, the team will provide practical training in literacy techniques and classroom management. Their goal is to help meet basic needs in education while sharing Jesus’ love. 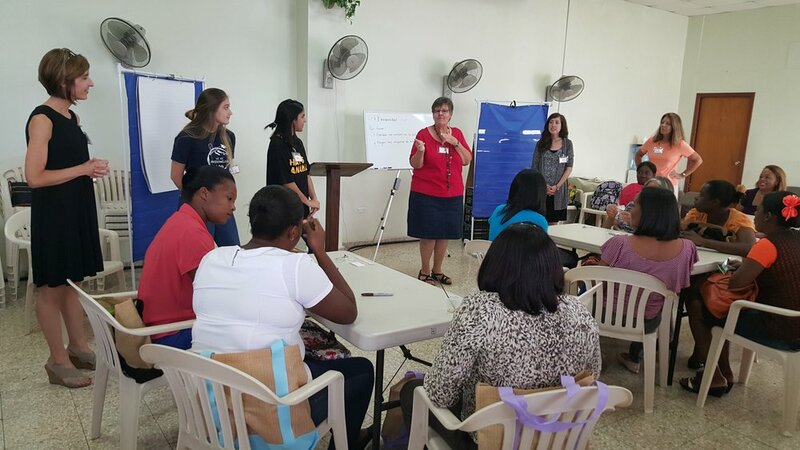 On July 25, 26, and 27, 2017, our five person team of educators conducted teacher training workshops for some very special Dominican public school teachers. Primarily, we presented lessons and strategies for teaching writing to their young students, but also had the opportunity this year to do some tutoring training with two women from the small village located outside Cercadillo. More importantly, we had the opportunity to share Christ-like love with our eager-to-learn group. God’s hand is definitely at work in such amazing ways in Cercadillo and in the public school with which we’ve partnered. Teachers are equipping themselves to be better and better teachers, role models, and leaders for their students. God has placed missionary, Ina York, in their lives full-time to continue pouring love and the Gospel into the hearts of those there. Through her ministry, women are being taught marketable skills, like sewing and crocheting, and how to manage finances for their families. Children are being practically and spiritually fed through her summer camps and tutoring program. Our teaching group has been blessed to be a part of such a needed and loving ministry! God loves the people of Cercadillo and the Dominican Republic (DR) and He loves you too! Please continue to pray blessings upon our friends in the DR.